**HOTEL OPTIONS: VALLEY HARVEST INN (831)678-3833 OR MOTEL 8 (831) 678-3814 IN SOLEDAD. PRESENT YOUR TACOS & TEQUILA TICKET AT CHECK IN AND GET A DISCOUNT. Tequila has now risen to one of the fastest growing spirits in the world. Everyone is now appreciating the quality of 100% Agave Tequilas. The days of salting your hand and biting into a lemon to mask the harsh flavors of a shot of tequila are just about gone. These smooth and silky tequilas are to be appreciated. Kick off the Cinco de Mayo Festivities by coming on a colorful adventure to Jalisco, Mexico, home of Tequila and savor some of its best flavors, paired with some delicious local Latino cuisines. 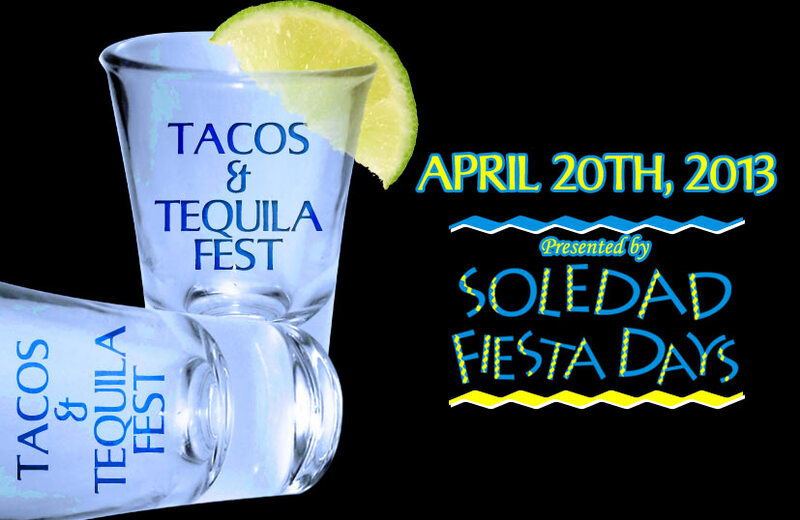 Soledad Community Fiesta cordially invites you to join us in the 3rd Annual “Tacos & Tequila Fest” on Saturday, April 20, 2013 at the Soledad Community Center in Soledad. The fun starts at 6:00 pm with a strolling reception with multiple areas to sample tequilas as well as hors d'oeuvres from our local restaurants. The spirit of Mexico will be enhanced with the festive music playing in the background getting you in the mood to enjoy “Tacos & Tequila”. Please feel free to contact me at 831-675-0415 if you have any questions. I look forward to hearing from you in the near future and thank you in advance for believing in the spirit of giving to others in need.